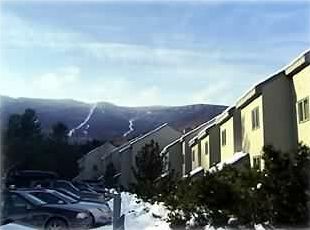 You cannot find a more convenient ski on/ski off location for a beautiful slope-side condominium at Sugarbush Mountain. It is nestled alongside the picturesque Snow Creek with windows facing the mountains. Parking is conveniently located at the front of the unit. We offer Claybrook quality and convenience at half the price. Local management is available to assure continued quality throughout your stay. The location of this unit makes it very quiet and easily accessible to the condominium's firewood shed. An iPod speaker deck allows you to enjoy high fidelity music from your own iPod. Our condominium is a lovely home base for the wide range of activities the Mad River Valley offers year round. Ski Sugarbush and Mad River, cross-country ski nearby, ice skate in Waitsfield, and work out, play tennis, or swim at the sports complex at Sugarbush. In warmer weather, guests can enjoy the pool, hike, canoe, bike , GOLF, and enjoy exploring the galleries, craft, book, and antique shops in Warren, Waitsfield and other quaint local valley towns. The area offers fine dining in many valley restaurants. During leaf season we have spectacular views. In summer months, the condominium pool is open and, in winter, swim and luxuriate in a jacuzzi at the sports complex located two minutes away. A reasonable daily user fee is required at the sports complex which includes not only pool and jacuzzi, but also tennis and an exercise gym. The two bedroom, two bath, first-floor unit is beautifully decorated with color-coordinated interior that stands out among Snow Creek and other local condominiums. The layout is as follows: master bedroom - queen-size bed; second bedroom - three twin beds, one decorated as a day bed for TV/movie viewing; living room with sleeper sofa for two; two full baths with tubs. Living room and dining room, both have a view of the wood-burning fireplace. Deck off dining room sliders. Snow Creek condominiums are well insulated so guests are comfortable, cozy, and not bothered by noise. Ski off, ski on access is off a gentle slope. Check in and out is conveniently mountainside and can be arranged at any time of day or night through our local agent. Please note that we have a limited number of reviews because we have had seasonal renters for many years who return annually. We do make weeks that they can not use during the season available for rent. We are vacation property owners who are passionate about travel. Over the years, we have acquired a small number of very select vacation properties to rent to our guests. We have 20 years of experience in owning and renting superior properties in exceptional locations. We are not a large company or a rental agency but a small family business owned and managed by a couple who take a great deal of pride in offering you a well maintained, well appointed, carefree vacation home. We continually update and upgrade our properties to assure our guests all of the amenities and comfort they expect and more. It is our pleasure to proudly offer these properties. Because of the locations and the amenities, our properties are never the lowest priced properties in the area, but we strive to ensure good value for our guests. We visit each property regularly, and update and upgrade as required to keep them in platinum condition. This way our guests can be sure that they can always count on a first class experience in every way. We hope you will choose to be our guests. Ceiling-to-Floor Windows face the Mountains and Snow Creek, Well Insulated to keep the unit toasty warm in winter, Large Foyer for Outerwear Storage, Outside Ski Locker adjacent to entrance, Full Sports Complex available, the Convenience of this first-level unit is welcomed after a day's workout. Great location! Convenient, comfortable, cozy. Thanks for the great feedback, Lisa! It was a pleasure to host you! We loved our stay at this ski on/off condo. It could not be any closer to the lifts and the condo is extremely clean and well-maintained. We would ski all day and then relax in this cozy condo before heading out to dinner. Then, a very restful sleep. Rinse and repeat. Just what the Dr. ordered. Highly recommend this lovely place. Thanks for taking the time to share your experience with us and other guests. We're delighted that you enjoyed your stay at our condo! Thanks again for staying with us. My family rented this condo for the first week of July while we were in town to attend my daughter's wedding in nearby Waitsfield. It is a fantastic condo, tastefully decorated and well maintained. There was plenty of room for four adults to spread out and relax. Being there in the summer, we were able to enjoy the pool the day after the wedding. The condo's location is perfect. There is easy access to the many activities at Sugarbush, and the location is in close proximity to other attractions in the area such as Ben and Jerry's, the Cabot cheese outlet, and Stowe Mountain Ski Resort. While some of the restaurants were closed for the summer, we did go to the Common Man which is very close on German Flats Road - FANTASTIC food. I would highly recommend this condo and if we're ever back to the area we'll definitely try to rent it again. My family and I spent a week here and it was great. The condo is located in a perfect spot which allowed us to come back for lunch and come and go on our own schedule. The 5 of us were very comfortable. We stayed in every night watching the Olympics! We had a wonderful stay Columbus weekend even though the weather wasn't the greatest. The location and set up of the condo was perfect-enjoyed the fireplace to take the chill out!! The condo and space were great were perfect for five of us. It had everything we needed in the kitchen. Even in summer it is cozy and remains cool inside shaded by trees while it is hot and sunny outside!